Fujifilm Corporation are to discontinued some of their silver halide (film) products. According to translation on Fujifilm's Japanese site where President Shigetaka Komori says "Market conditions continue to shrink in silver halide film, and production efficiency while reviewing the future of product line, we will continue to build a system available to continue the photographic film." Fujichrome Velvia 100F in 35mm, 120, 220 and sheet film will continue to be produced along with other current films. 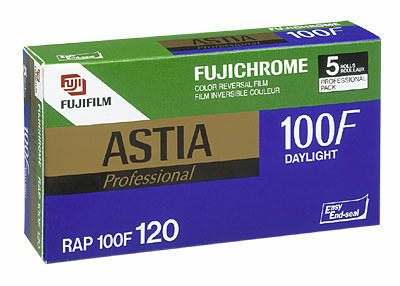 This is a real shame that Astia is going, I like it the best of all the films I've used. It's super sharp and has the lowest grain of any film on the market to day. I think Astia was unfairly treated by many photographers as they had heard it was only suitable for weddings and portrait work, but I find it great for landscapes. Who needs lots of contrast, give it a colourful scene and it will replicate it faithfully. This sounds like the end of an era - or at least the beginning of the end. Yet another good film comes to past, and I am just getting over Kodachrome......:( I'd better get some rolls then, to put through my Rolleiflex and Bronica, before its too late. I'd better get some rolls then, to put through my Rolleiflex and Bronica, before its too late.